Have you meet my wee boy Cooper yet? If you're a regular visitor to this blog, then you'll know he loves cooking and baking. 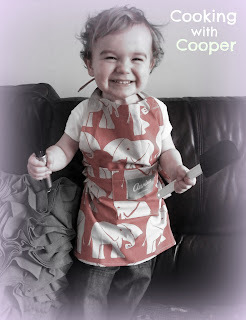 In fact, he has his own wee series over at Baby Centre called Cooking with Cooper. Each of Cooper's recipes are really easy to make and have step-by-step photos to follow. Today we decided to make some simple pastries along the lines of our pinwheels, but this time a sweet version. Cooper filled the pastries with jam, desiccated coconut and some mixed dried fruit. They were such a treat and Cooper loved making them. 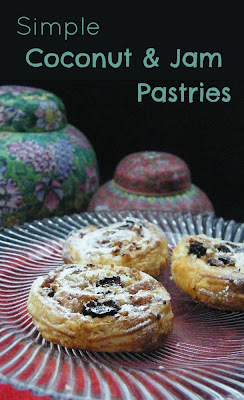 These sweet pastries are so simple to make and utterly delicious. 1. Preheat oven at 190c /170c fan /gas mark 5.2. Take the pastry out of the fridge 10 minutes before you plan to start.3. Carefully unroll the pastry.4. Spoon the jam over the pastry and spread evenly,5. Sprinkle fruit across the jam layer.6. Finish off with a layer of coconut.7. Roll the pastry up and wrap in the original paper, then pop it in the fridge for 30 minutes to chill.8. Slice and place circles of pastry on lined baking trays. Leave a little space between each pastry.9. Bake for 7 - 10 minutes until golden.10. Dust with icing sugar and enjoy while still warm. It's bloomin annoying and even more annoying when companies that have done it to you in the past to improve their page rank come back and ask you to remove it as if it is your fault it is there. Sheesh!!! I will tell Cooper you like his pastries. The boy is a genius! Send him round to do some baking for me please. You've given me an idea Cooper, when I have some leftover pasty instead of savoury pinwheels I'm going to make some sweet mini ones just like yours (but without the coconut:-)! I look forward to your next recipe Cooper! AWWWW he's adorable! He's going to be a heartbreaker when he grows up, esp if he can cook too! Pastries look liek a great fun idea! He is happy when he's baking, mind you he is a happy wee boy in general. He wakes up in the morning smiling. I wish I did. He is so cute Jacs! Not much is cuter than pastries, but Cooper sure is. You are going to need to start a fan club for him, Donny Osmond-stylee! Love these simple pastries! Can't go wrong with jam! And your cooking partner is so cute!